Can its connected TV service become anywhere near as popular? Freeview announced today that it has passed the magic 100 million devices mark. Since first flinging the wonders of subscription-free digital TV into our homes back in 2002 Freeview DVB-T tuners have been jammed into TVs, set-top boxes, DVD and Blu-ray players. Most of that 100 million is made up of televisions with integrated tuners - some 66% of them - with 16 million Freeview HD TVs and set-top boxes being shipped since it launched the HD service back in 2010. 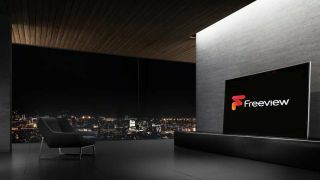 Freeview is gleefully making this announcement now as it's soon set to unleash its connected TV service, Freeview Play. It is eager to show the progress it's made in getting new technologies out to the wider public, from the digital TV revolution to the HD evolution and now with the move towards net-connected televisions. "Reaching this milestone is testament to the ongoing popularity of the Freeview service," said Guy North, MD of Freeview. "Since its launch we've taken the country from analogue to digital, linear to time-shifted, and SD to HD. Soon, we will take our viewers from digital to a connected TV world with Freeview Play. "There's a great opportunity for Freeview Play to reach scale in the connected TV market. We will bring simplicity to what is a very confusing market for people right across the UK, and expect Freeview Play to become the new norm in how we watch television in the future." Freeview is currently the most popular TV service in the UK, used by over 19 million households, with more than half of those as the sole TV provider according to Ofcom. Freeview though is still going to have its work cut out getting those people to upgrade to its new connected service. Freeview Play requires brand new hardware to allow access to its integrated, web-accessed on demand services. Which is why it's chasing TV manufacturers and set-top box makers to act as hardware partners. Panasonic though is already on board to include Freeview Play in its 2015 lineup of Viera TVs. But if it can seriously emulate the experience you get from Sky TV and YouView's integrated on-demand services it could well be a worthy upgrade to the UK's favourite TV service.